Cats have a reputation for being self-sufficient loners who don’t need any special attention or care, but that’s a feline fallacy for sure — in fact, it’s the opposite of the truth. It’s important to recognize that cats have specific needs, some of which may not seem obvious at first glance. Whether you’re bringing home your first cat or have been a cat person your entire life, you may be falling short on your cat’s care without even knowing it. Here are five common mistakes I frequently see cat owners making — and how to avoid repeating them with your own cats. They don’t keep the litterbox clean. If there’s one word that best describes cats, it’s fastidious. Your great-aunt Betsy has nothing on your cat when it comes to purr-ferring a clean bathroom. And the litterbox is, indeed, your cat’s bathroom. To keep her using it with a smile, I have three top tips: Scoop it every time she uses it; provide one box per cat in the home, plus one extra; and give the box a good scrubbing every couple of weeks, then fill it with fresh litter. Your cat will love you for it. They don’t provide water in a cat-friendly way. Water is an essential part of a cat’s diet, but it can be difficult to get your cat to take in enough. In many cases, it’s because water’s flat, still surface is hard for cats to see. They can’t hear it either. You can solve this problem in a couple of ways. The first is to use a pet fountain. The splashing water will attract your cat’s attention and encourage her to drink. An alternative is to leave a faucet dripping slightly into a sink. Another simple way to help get water into your cat is to make sure she has canned food in her diet. It’s high in water and can be a savory option to help keep her hydrated. They don’t use food puzzles. Your cat doesn’t need a food dish. She’s a hunter by nature. Her wild cousins spend hours seeking out their meals. Your cat should, too. It’s a good way to exercise her body and her brain. Put her daily ration of food into a treat toy and let her have at it. Pushing it around will help keep her busy and interested. They don’t train or play with their cats. Train cats? It’s not an oxymoron. 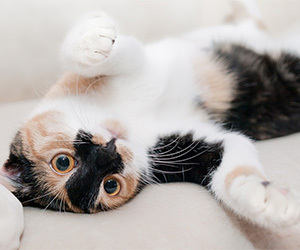 Cats can learn all kinds of behaviors from a simple stay or high five to walking on leash or running an agility course. Training engages your cat’s brain, and play is just plain, well, fun — for you and your cat. Training and play help to strengthen that wonderful human-feline bond by deepening the communication between the two of you. They don’t take their cats to the veterinarian. A 2011 study found that nearly 45 percent of cat owners don’t take their cats to the veterinarian during that year, and the primary reason was because they weren’t sick or injured. But even if they don’t need treatment or vaccinations, it’s important for cats to get that annual checkup. Cats age more rapidly than humans, so an annual exam can help ensure that any percolating health problems are caught and treated early.